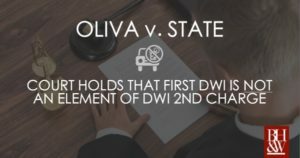 It is well established in both Texas statutes and case law that the existence of two prior DWI misdemeanors will enhance the third DWI to a felony-level offense. See Texas Penal Code § 49.09(b); Ex Parte Benson, 459 S.W.3d 67, 75-76 (Tex. Crim. App. 2015). A variable “three strikes and you’re out” type of statute, the law was enacted as a legislative response to deter potential repeat offenders from creating dangerous and preventable hazards on Texas roads. In this statutory enhancement scenario, the third strike becomes the offense itself, thus, the third DWI offense is an element of the felony. As a result, the defendant is punished according to the felony sentencing guidelines. But what happens when the defendant only has one strike—one prior misdemeanor DWI on his record? Would it make any difference if that DWI happened nearly a decade prior, on an otherwise clean driving and criminal record? Recently, the Court of Criminal Appeals sought to determine the legal significance of companion statute TPC § 49.09(a), whereby the defendant had only one prior misdemeanor DWI offense. TPC § 49.09(a) states that the “existence of a single prior conviction elevates a second DWI offense from a Class B misdemeanor to a Class A misdemeanor.” The CCA had to decide whether having one single prior DWI constituted an element of the crime or whether the one single prior DWI was only relevant in the punishment phase. Early in the morning in May of 2015, two Houston-area police officers responded to a call from dispatch about a suspicious person. Tex. R. App. P. 47.2(b), accessed 24 May 2018 via https://law.justia.com/cases/texas/fourteenth-court-of-appeals/2017/14-15-01078-cr.html. Sitting slumped over in a parked car was Jose Oliva, illegally parked with the engine on, in a lane of moving traffic. Concerned for Oliva’s health and safety, law enforcement attempted to alert Oliva, but he remained unresponsive. Police opened the car door and Oliva fell out onto the curb. Once Oliva woke up, law enforcement administered a field sobriety test; Oliva failed and was arrested. Blood testing later confirmed that Oliva had a blood alcohol level equivalent to having just ingested nine alcoholic drinks within the hour. Oliva was charged with DWI “by information” which mentioned a previous DWI on Oliva’s record. In Texas, a person may be charged via an indictment or via an instrument called an information. Article 21.20 of the Texas Code of Criminal Procedure defines an “information” as a written statement filed and presented in behalf of the State by the district attorney, charging the defendant with an offense. Oliva’s information described the May of 2015 DWI arrest and it mentioned a prior misdemeanor-level DWI offense on his record. During the trial, Oliva’s prior DWI was never mentioned, even though it was present on the information before trial. The jury convicted Oliva of DWI. Finding that he also had a prior DWI as alleged on the information, Oliva’s conviction was then increased, or enhanced, to DWI 2nd, which carried a sentence of 180 days confinement. Oliva appealed to the Fourteenth Court of Appeals in Houston. On appeal, the appellate court held that under the statute’s plain language meaning, one singular prior DWI conviction is an element of the offense of Class A misdemeanor DWI under section 49.09(a)—much like the “three strikes and you’re out” felony-enhancement statute of 49.09(b). The appeals court reasoned that a fact that elevates the degree of an offense is necessarily an element of the offense and that § 49.09 lacked the “shall be punished” language present in other statutes containing punishment-only enhancements. The State of Texas petitioned the Court of Criminal Appeals to review this case once again, to determine whether the introduction of a defendant’s prior DWI is proper at the guilt-innocence phase of a criminal trial, or whether such a disclosure is only relevant under 49.09(b) during the punishment phase. Such distinction could have implications for bias, or taint, at trial, among other defense strategies. To recap, Texas Penal Code § 49.09(a) provides that the existence of a single prior conviction elevates a second DWI offense from a Class B misdemeanor to a Class A misdemeanor. First, the CCA looked to the wording of the statute to find its “plain language” meaning. “In construing the meaning of, and interplay between, these statutes, we give effect to the plain meaning of the text, unless the text is ambiguous or the plain meaning leads to absurd results that the legislature could not have possibly intended.” Here, the CCA found that the plain language meaning was ambiguous and could lead the interpreter to conclude mixed, confusing results. Third, the CCA reasoned that it would have to deep dive into existing case law to assist with determining the meaning of the statute. Looking to Calton v. State, the CCA suggested that “a statute could unambiguously prescribe an element of an offense by setting forth a fact that would increase the degree of the offense; a punishment enhancement “does not change the offense, or the degree of the offense of conviction, as there can be no enhancement until a person is first convicted of an offense of a certain degree.” 176 S.W.3d 231, 233-34 (Tex. Crim. App. 2005). Next, looking to Ex parte Benson, another DWI case, the CCA held that “a prior conviction that merely enhances the offense level would not be an element of the offense.” Benson, 459 S.W.3d at 74-75. In conclusion, the CCA held that although the statutory language is ambiguous, various factors suggest that the legislature intended that § 49.09(a) prescribe a punishment-only issue. It is important to note that Justices Keasler and Yeary filed a dissenting opinion about the CCA’s holding. In the dissent, the Justices aver that the CCA should adhere to the language of the case law in Calton, regardless of the wording of a particular statutory provision, so long as the provision is not explicitly labeled a punishment issue. Even though this case law is not supported by authority, the dissent claims that the interests of swift justice “would be better served by the wholesale adoption of this language…[as] such adoption would simplify our analysis by creating an easy, bright-line rule.” Further, the dissent also states that Calton’s language is consistent with the use of the phrase “degree of offense” in connection with the word “convicted” in the statute that prescribes the requisites of a criminal judgment, Article 42.01, so that the prior DWI conviction should be introduced at the guilty-innocence phase of a criminal trial. Which is More Important, Swift Justice or a Fair Trial? In sum, this ruling is a win for those who have made a couple of DWI mistakes, but are not repeat, habitual offenders. For defense attorneys, knowing exactly when evidence of a prior DWI can be admitted on the record during a criminal trial is paramount to developing a successful legal strategy. Should evidence of a prior DWI be introduced too early, the judge or jury may become biased, or tainted, against the facts and evidence in the case before them. If the evidence is introduced at the punishment phase, for the purposes sentencing enhancements only, the defendant may have more solid footing to defend against the DWI charge before the court.